Very excited to see what the Ultimate decks bring to Organized play and the ACG in general! This type of boxed set was precisely the type of product I was hoping for when the Adventure Card Game was announced; sets that mirrored the production line for the RPG. Looking forward to seeing how this one works out! Going through the cards this more or less looks like a Samurai Class Deck with only one character in it. Do wanna play Hayato, but want to understand what I'm buying here. How do these decks work? I'm kind of new to the ACG but wondering about the add-ons. I figure it's a bunch of extra cards but do you just add them to your campaign box mixed with everything else? Or are they used separately for some purpose? Both. If you are playing with your box at home, you can mix in the boons according to their adventure deck number. So, just the 'B' cards when you are starting out, then add in the '1' cards when you get to Adventure Deck 1, and so on. 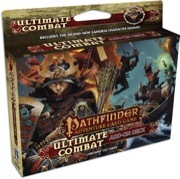 You can also use the Ultimate Combat deck in Organized Play. The ACG Organized Play program is described here. So you could play Hayato out of that deck, or combine that deck with e.g. the Fighter deck and play Valeros with a bunch of awesome new cards that weren't around when the Fighter Class Deck came out four-ish years ago. As for playing another campaign, do you mean with the same base set, or a different base set? Basically, whatever base set you have, if you want to play Hayato, just add the Ultimate Combat deck into your base set, and you'll have appropriate samurai weapons, armor, and gear to potentially find during your adventures. When you are done, you can pull those cards back out and put them into another set, if you'd like. Is there a card list for the deck?